Asphalt Driveway Installation is one of those useful skills that can help you out in your daily life in a myriad number of ways. Whether you are just a housewife, trying to help your husband stripe that parking lot, or someone searching for a quick side business, it would serve you a deep sense of self-satisfaction. Parking lot line striping is surprisingly easy. Basically, anyone can do it, provided you put up with a little bit of effort in learning the skill. Once you have it, you have available side business almost for a very long time as it is one of the kinds of work that does not need specific timing or even a lot of time in fact. Or you can manage line stripping around your house without spending those extra bucks to hire a professional. This article will guide you through the basic principles, that you need to be familiar with in order to start. Further, this will also tell you some of the caveats in the business you need to know in order to be successful. You will also find useful tips and tricks along the way. Regardless of whether you are a beginner or not, you will benefit immensely from what follows. You will be able to review some of the techniques you have been using, or are going to use. And learn how to be more resourceful about them. Benefits of choosing to stripe. When to restripe and when to stripe? How to choose the right stencil? Roller or a line striper? Pylons, caution tape, reflective beads. Some tips and tricks and cautionary points. How to start a stripping business. One of the businesses around that requires the least capital for starting up. Just about $5000 is enough to get you going. You can choose to work part-time initially, to see if it works out. This is particularly possible as there is no specific time as to when you can or cannot do line striping. When you are off duty from your primary job or have holidays, schedule the work for them. The equipment usually lasts a long time with proper maintenance. In addition, you only need to keep what you need, no stockpiling is required for this. Does not need you to hire or take up specific space. You can work from your garage. Be it a bad, or a good economy, you will keep earning. In a bad economy, people would most likely restripe, and in a good one, they will stripe around new buildings and parks. You will only need to purchase paints, stencils, and a roller once. And these will last a long time, other than the paint of course. No need for repeated payments to the servicemen. Allows you to do your line striping to your own liking, by using a line striping machine. When To Restripe Or Stripe? Striping needs are very common. 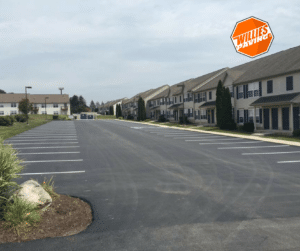 If you are line striping for personal purposes, anytime you want to change your driveway or make another parking hub around your house, you need to stripe. 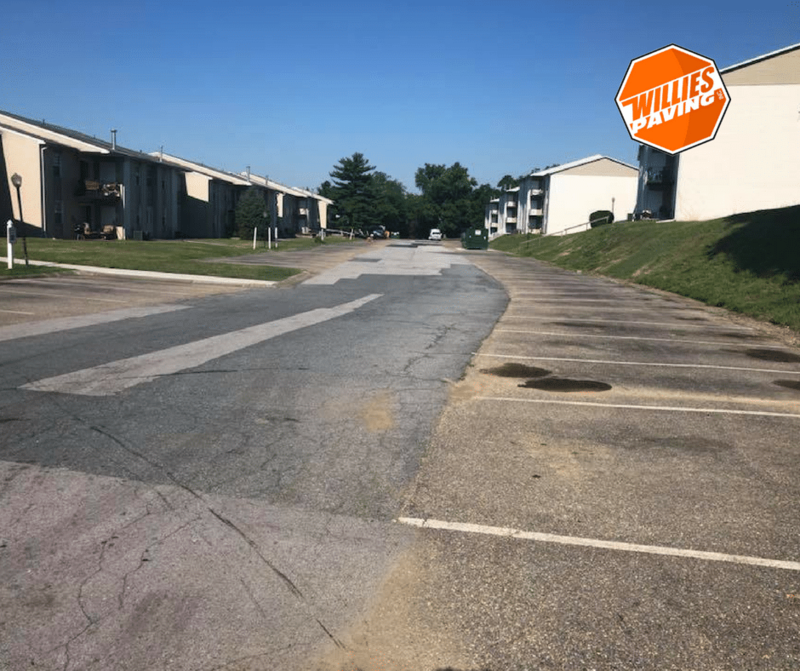 If for business, every time a new building is constructed, or another pathway in some neighborhood is made, you might be called upon to do their striping. Whenever the necessity arises. For personal purposes, this is very common. 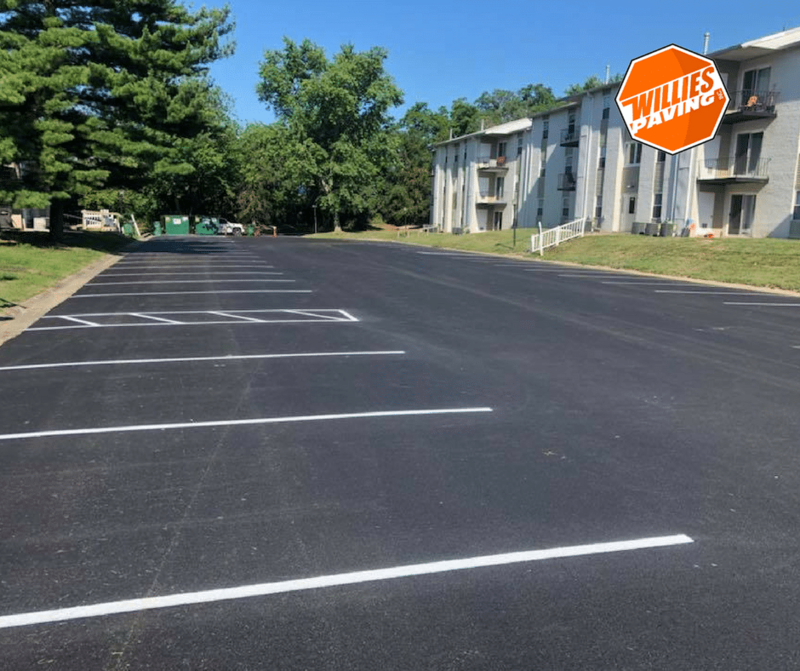 Every time the paint in your parking lot washes away, you often need to go for line striping. As for business, restriping is even more popular than striping. Every now and then, some corner of your town or neighborhood will have a washed-up pavement, you might be called up for pavement striping. Standard paint will usually not stick to either asphalt or concrete, that is why you need to have specialized paints, called traffic paints. They can be water-based or some other solvent based. Water paints are often environmentally friendly and do not give off harmful fumes. However, the solvent based ones are more durable and often recommended for highways and race tracks. In order to choose the right paint, you can refer to this helpful guide. How to choose the right striping stencil? But all of these measures are subject to the kind of line striping equipment that you are using. For personal purposes, you can go with a roller. However, for business, it advisable to use a line striper, in order to have a better and more accurate layout. The paint lines are usually where people lose grip and slip. In order to prevent that, especially in places like the diagonal lines of a pedestrian crossing, using grit is important. Pylons, caution tape, reflecting beads. All of these find their use in some way or another, in order to make your experience of line striping more pleasant. High visibility glass beads are applied wherein the paint is still wet. Also, some seal coat is advisable for covering any spill. First and foremost, you need to use the gas blower or power washer to completely clear the asphalt. This will allow for the paint to stick. Check for cracks and the places that need crack filling. And then see if you need to seal coat any of these patches. Only then are you good to go? You need to refer to local zoning laws for handicap and fire zone clearances. Call up any towing service to haul away abandoned or broken vehicles. Treat moss and the mildew present with a recommended cleaner before you start the line marking. Take special care to remove dirt and other small items that might be lying in the area you are going to stripe. The layout of an attractive and efficient parking lot depends on the specific requirements of the place. To understand it better, you can refer to this. Here, we simply describe a few common layouts, you would like to know, in order to start your line striping. These parking lot striping dimensions are very crucial to your layout. Single line: A single striping line separates the car spaces. One of the most inexpensive layouts of all. Double line: This layout consists of double lines, with a separation of about 1 foot from each other. This type of parking lot line painting machine allows vehicles more room to open doors for easy entry and exit, and is often preferred. 90 degree: It creates a head in parking, i.e. the vehicle parks in a stall that is perpendicular to the curb face. 60 degree: This is the angled layout. It allows for more space for a vehicle to back out and exit the parking lot. Tandem parking: This layout is used for tight spaces. Herein the cars are parked bumper to bumper. Initially, you need to make a chalk line of your chosen layout. Get the tip guard to the side of the chalk line and follow it in a straight line. As the paint flows, you would want your paint stripe to be exactly on the chalk linings you have earlier made. In order to get more practice, try doing line marking on cardboards initially. You then need to move forward, making sure that you are keeping the machine parallel to the chalk line. If you are using a roller, make sure the ends of the roller are exactly where the chalk line is, and try rolling as parallel and straight along it as you can. Make sure you go at a steady pace. You don’t need to be too fast about it, just take normal strides. If you see that you are starting to move away from the chalk line, just slow down a bit, and align. Remaining focused on the painting parking lot line by hand. Focus on the point where the pain hits the line. Even if you had missed the chalk line, keep going parallel to it, as far as you can. Try to make sure that you do not deviate at odd angles from the paint line. When you see the end of the chalk line, try slowing it down. Focus on both the stopping point and where your paint has reached as of that moment. And eventually, stop at the stopping point. Just be easy on yourself, it ain’t very difficult. And you would definitely be better and better with practice. After you have stopped, try to assess the line marking if it’s decent enough, or at least parallel to the chalk marking you had earlier done. If not so, you either need to remove the fresh paint, or increase the thickness of the lines, to account for the deviance. Allow for the paint to dry up. 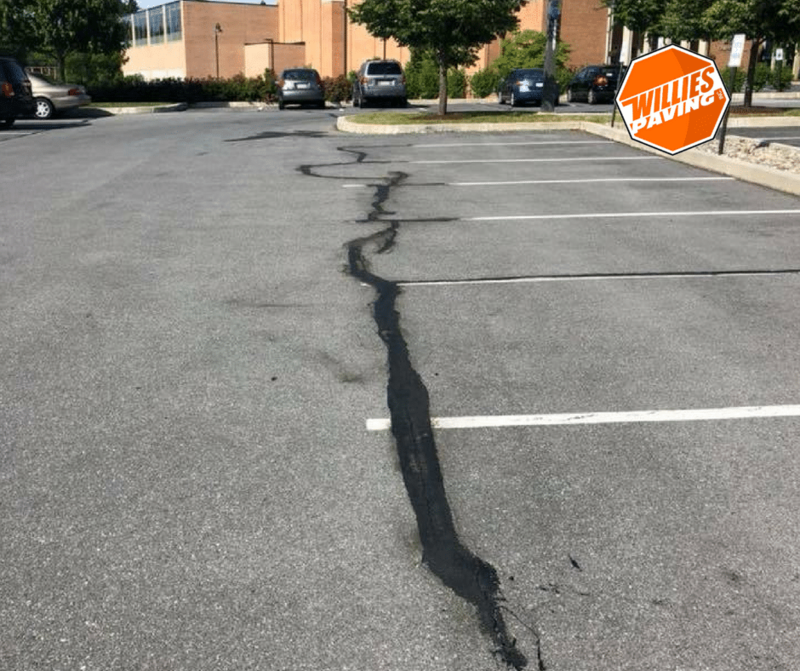 Use the parking lot line stencils, to put up good warning signs along the area where you are doing parking lot striping before you even begin the process. You can always find the tools and paints required for line painting in your local area. These asphalt paints are usually found in most of the paint shops around your place. As far as getting rollers and other utilities go, you will easily find such things in local hardware or paint shops. Some of these shops around the York and Harrisburg PA area would be the Sherwin-Williams Paint Store along Haines Road or the York Paint Store at 2680 Industrial Highway. 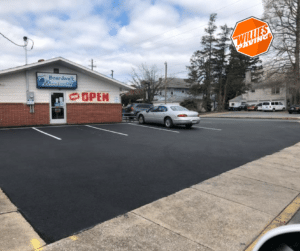 If you would need to hire a parking lot line painting business to help you, then reach out to Willie’s Paving online or on the phone at 717-932-8920. The parking lot line painting cost depends upon the quantity of pavement marking to be done, and if it is being stripped for the first, or is just a restriping. However, if you hire servicemen to do it for you, you would end up with some professional work. But if you decide to do it yourself, you would end up spending about $2000 dollars to buy the equipment in the beginning, but given the fact that the paint would only cost you about $70-$80 for a medium size parking lot, over a long time you will benefit substantially. 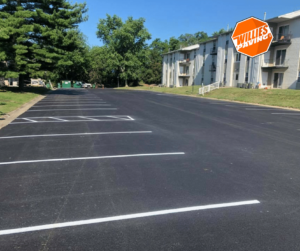 Allow for offsite parking for about 24 hours from the parking lot line striping. You would not want a car to accidentally tread over the underdeveloped paints, as it would completely ruin it. Make sure that the weather is dry for at least about 24 hours prior to line striping. If there is any rain or snow, the paint would likely come off, and you would have wasted precious time and resources. It is advisable to avoid rain for up to 4 hours after restriping. If it rains, make sure you cover the line striping with water resistant covers. Now, that you are familiar with most of the things regarding line striping, you must be eager to start it. It is actually a great way of carrying out a side business, and who knows, if things turn out well you can be on your way to expanding it into a major source of income. Also, with something as simple as the procedure above sounds, at first glance, you must be thinking that it’s just too easy, and you can simply roll it on to have wonderful parking or pedestrian layout. However, that is not so, you need a good amount of practice and experience to make that beautiful layout in front of your homes or your neighborhood. But, rest assured, it’s a skill to carry for a lifetime.